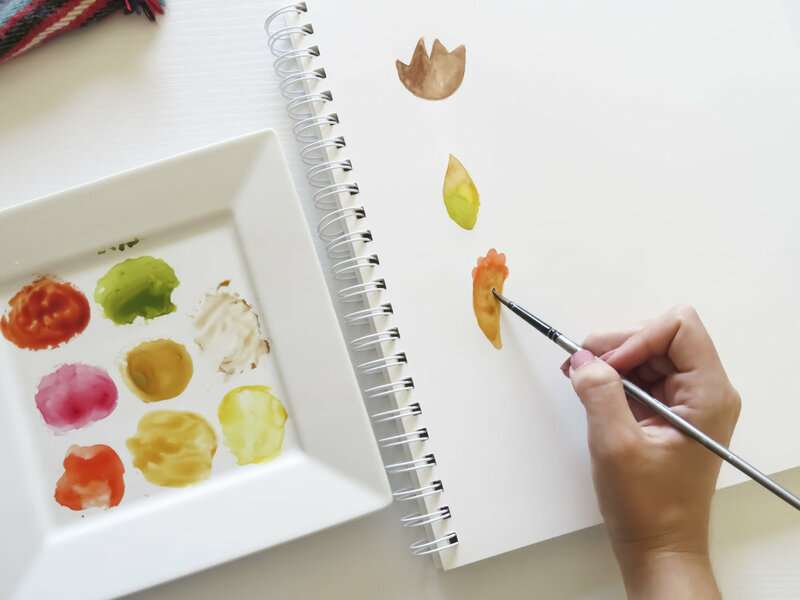 How To: Watercolor 4 Fall Leaves! So, it's totally 90 degrees here in my neck of the woods, but it is officially fall, and I'm ITCHING to bust out the riding boots and scarves and cozy oversized sweaters...I'm also itching to get my first PSL of the season because, as a former employee of Starbucks, I can appreciate it, but it has to be enjoyed on the true definition of an Autumn day. 90 degree weather ain't it. Never fear, though! I'm bringing fall foliage to ME no matter what. 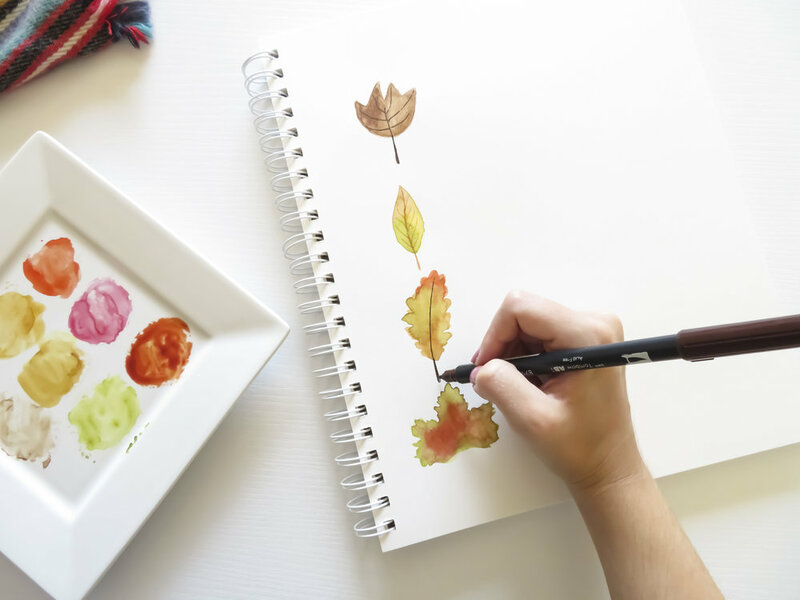 Today, I'm going to show you how to watercolor 4 different fall leaves. The possibilities are endless for this project! 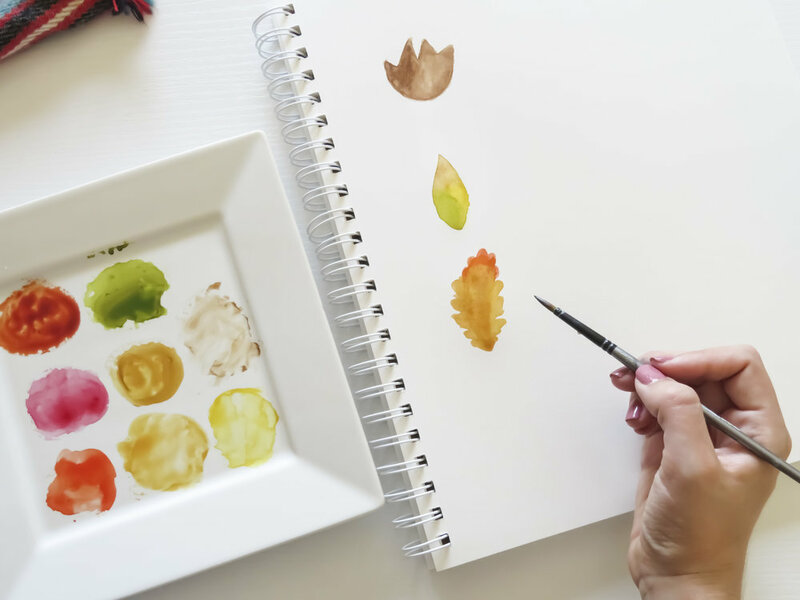 Once you're a leaf pro (don't worry, by the end of this you totally will be), you can create SO MANY beautiful Fall prints to hang in your house or give as gifts....imagine it now: Watercolor Leaf Wreaths?! 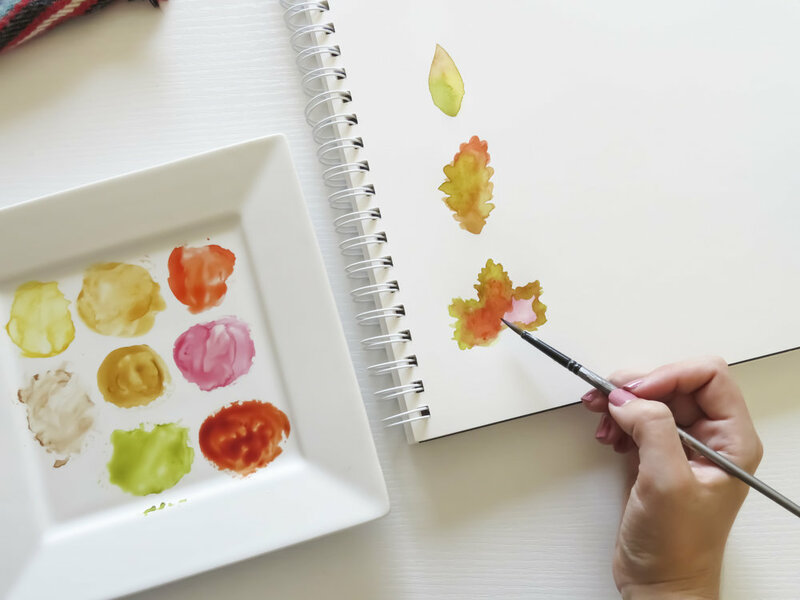 WATERCOLOR COFFEE CUPS WITH LEAVES SWIRLING AROUND? WHAT?! HOW CUTE. BRB painting that right now. Enough of me, let's get to the painting! 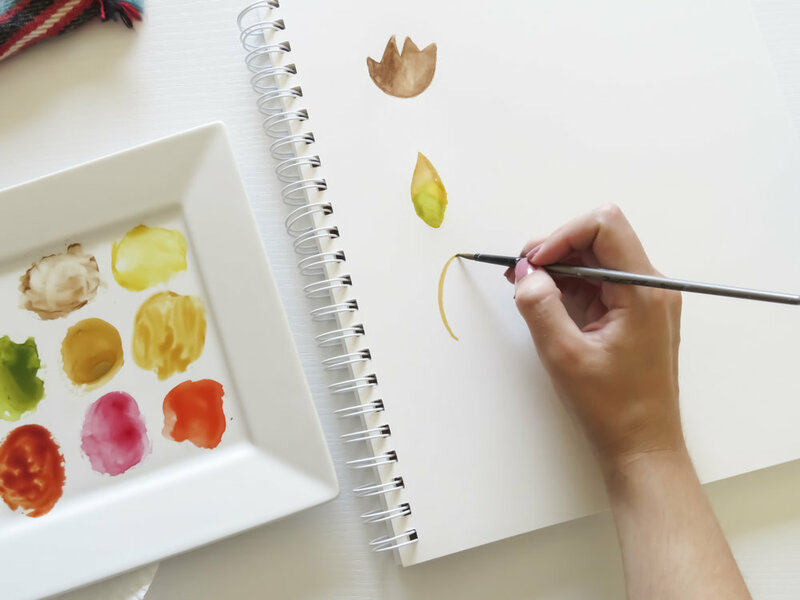 I'll be using a medium size round brush (Size 6) for each leaf! My leaves are a medium-small size. If you want to make larger leaves, use a larger round brush...the instructions stay the same. 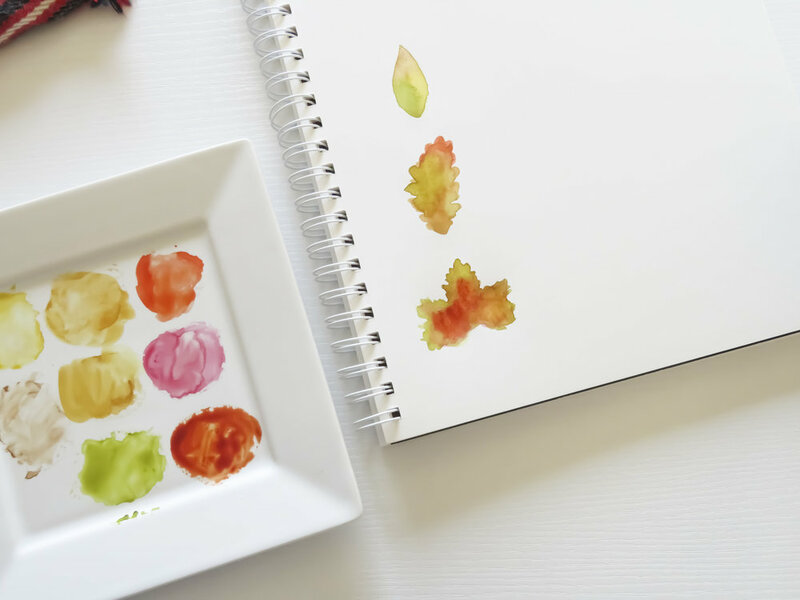 I'm pulling all my 'Fall colors' from two different watercolor palettes. On the left, I've got my favorite Winsor & Newton Watercolor Palette (Right now it's only $12 on Amazon), and on the right is my Decadent Pies Prima Set (On sale for $20). 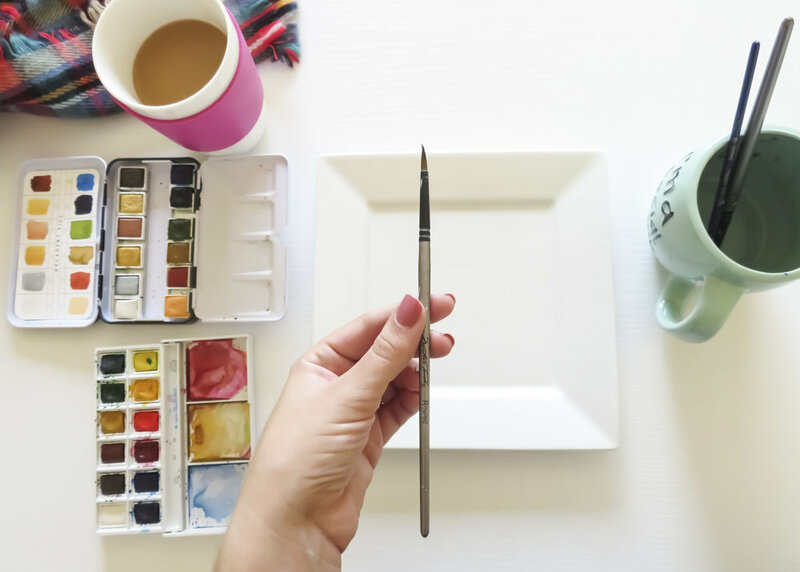 Because I'm pulling from two palettes, I have a ceramic dish to hold my watercolors and serve as my palette for this tutorial. Totally not necessary, but I like making things as simple as pie for myself since I tend to get frustrated with watercolors really easily. I pulled a variety of oranges, pinks, reds, yellows, green, and a brown. 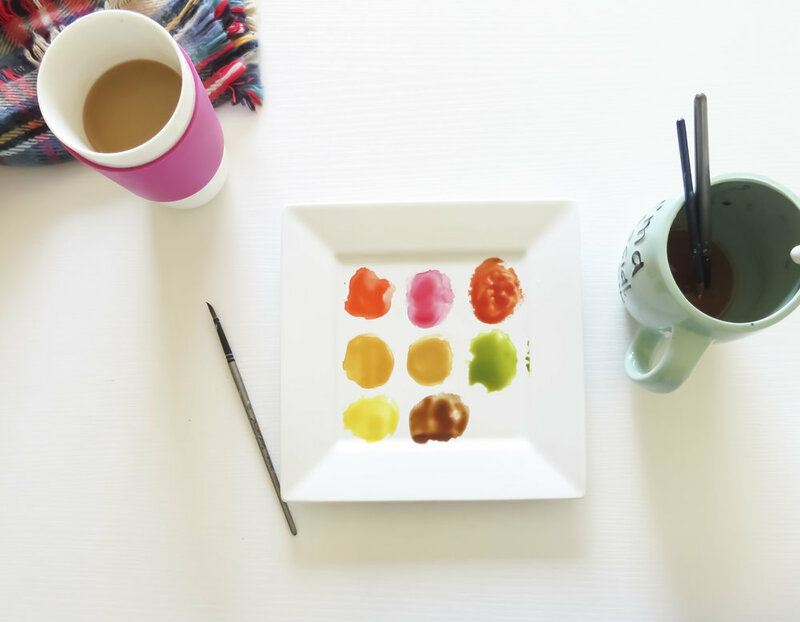 *If you're new to watercolor, and you're unsure of how to pull color from a palette onto a plate, here's how you do it: Using a wet brush, I dipped my brush in the pans and 'mushed it all around' until the brush was saturated in color. Then, I put the brush on the ceramic dish until the color was transferred. It's super easy! Off to the side, have a clean bowl or mug of water and some paper towels for blotting your brush or absorbing extra color from the paper, if needed. *For the entire tutorial, I'm keeping my brush pretty wet because that is how you achieve these really cool textures. So, keep that in mind! 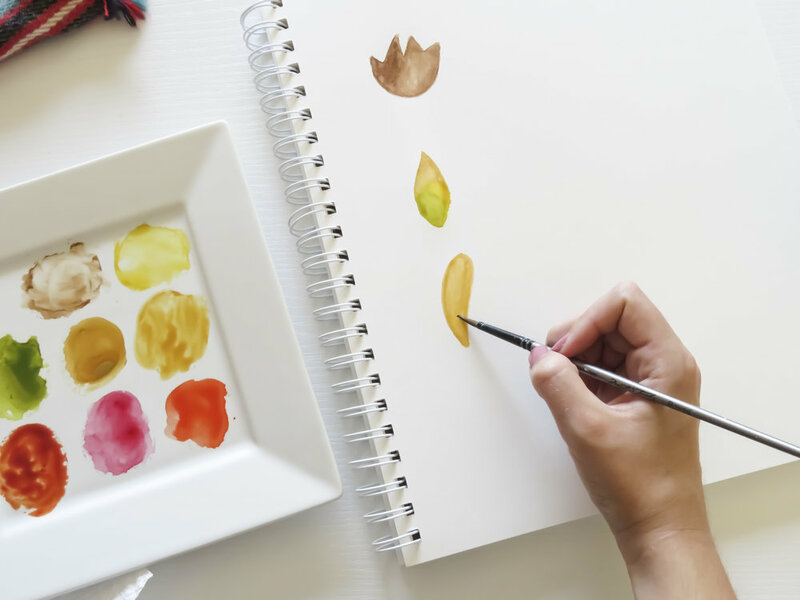 The Tulip Poplar leaf is the easiest of them all, because it requires only one color: brown. 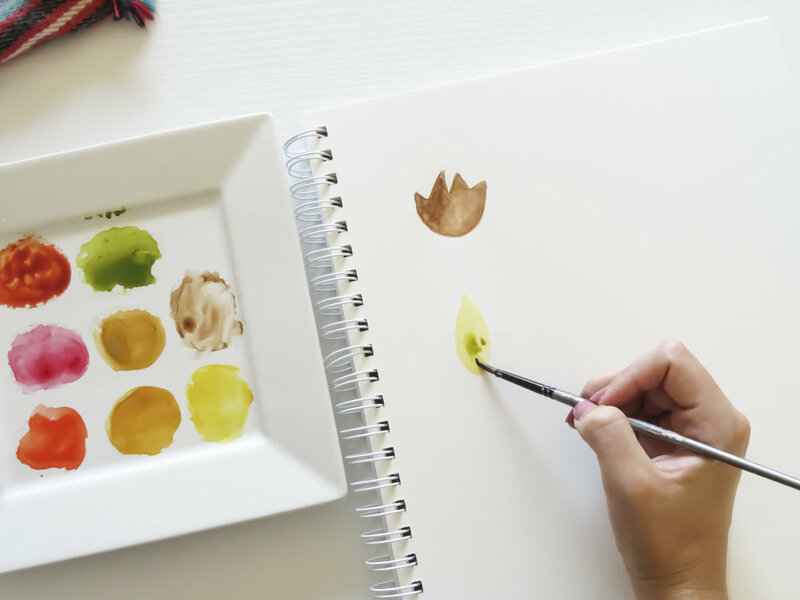 Dip into your brown, then make this wide U or half-circle shape. Finish the outline by drawing these triangular shapes on top. 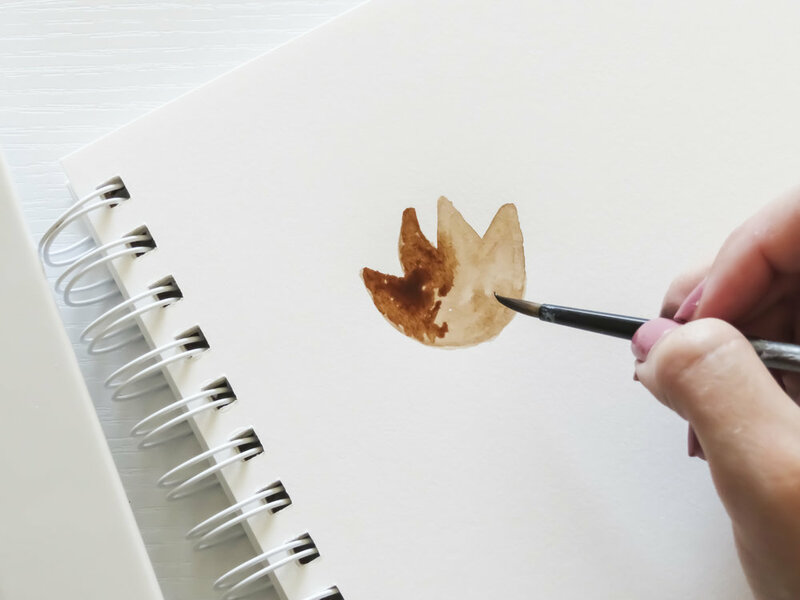 Fill in the outline, then, while the leaf shape is still wet, grab some more brown (this time, dry your brush a bit with paper towel, then grab the brown---it'll be more saturated this way), and dot the saturated brown paint into the wet leaf. 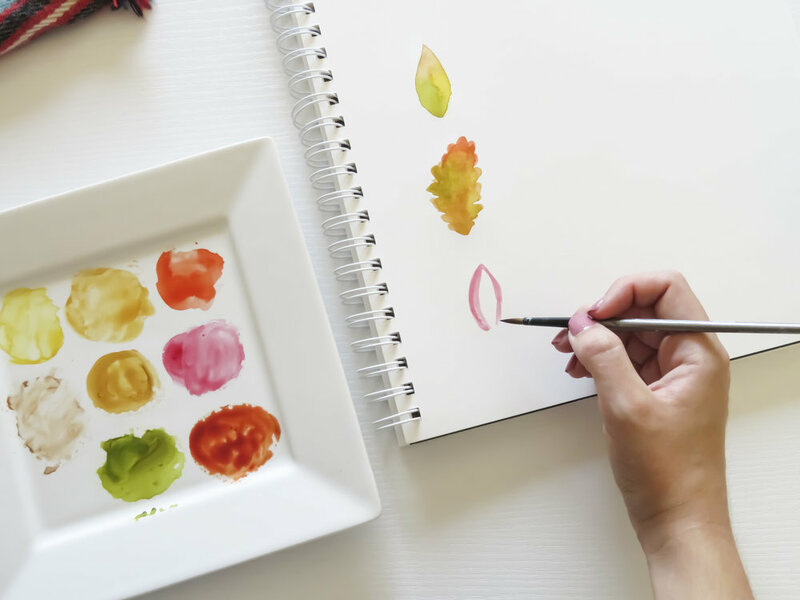 The color will spread, creating those awesome watercolor textures. 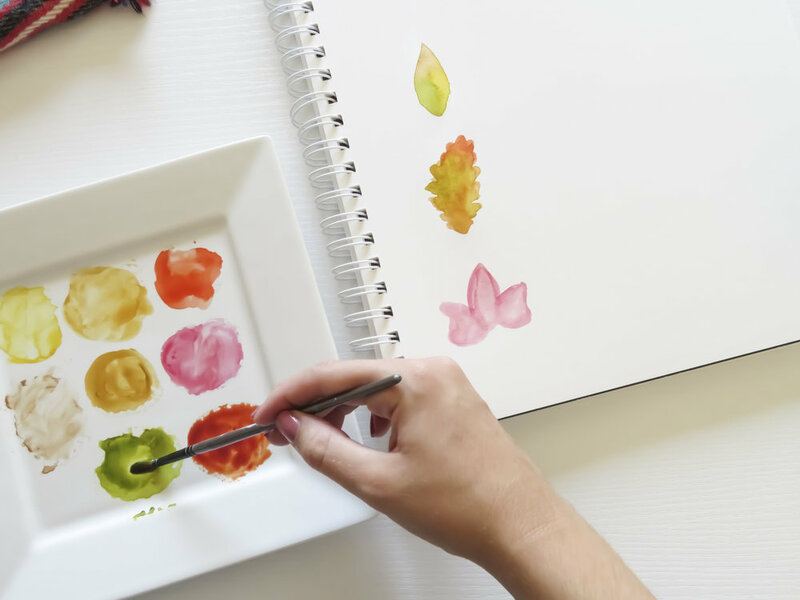 If you need to, get some clean water in your brush and dot that onto the leaf as well, creating more texture. This is the completed body of my leaf. We are going to add accents to it once it has dried! Until then, let's move to the next leaf. For the beech leaf, I'm using 3 colors to bring it to life! First, I start with an ochre/yellow base. If you don't have a golden yellow, really any yellow will work. 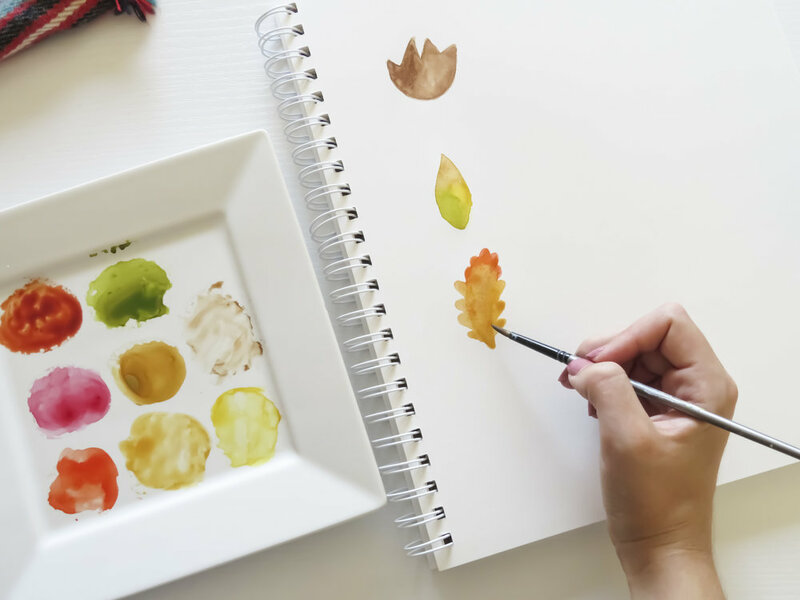 Create a basic leaf shape. 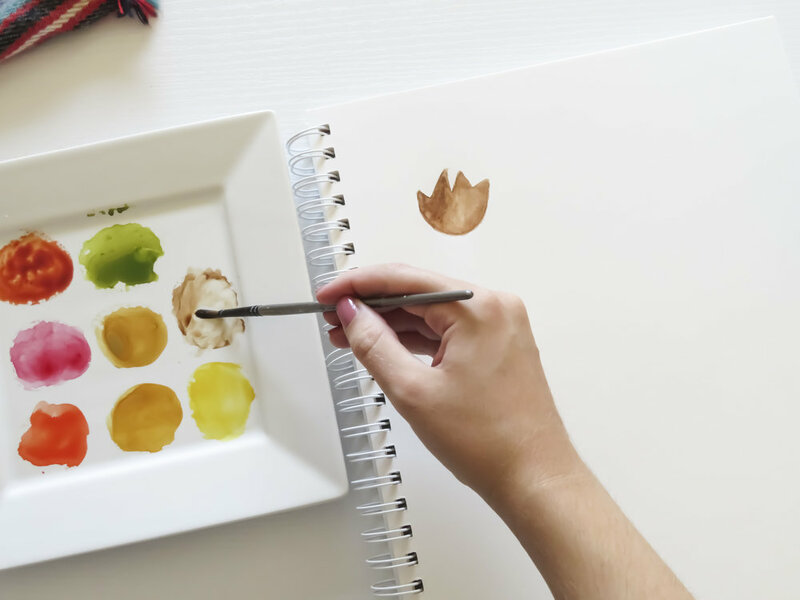 While the base is still wet, dot some watery-brown and watery-green onto the leaf base and watch the colors spread! Only a hint of your yellow base should be visible. Add more yellow to some areas if you think it's necessary. This is all about playing with color....anything will look great because foliage is so unique! This is what my beech leaf looks like so far. Once again, we'll add accents once it dries. Let's move onto the next leaf until then! I'm upping the intricacy with each leaf, so I've posted the photos in order (L-R), with the description below the entire set. Here we go! 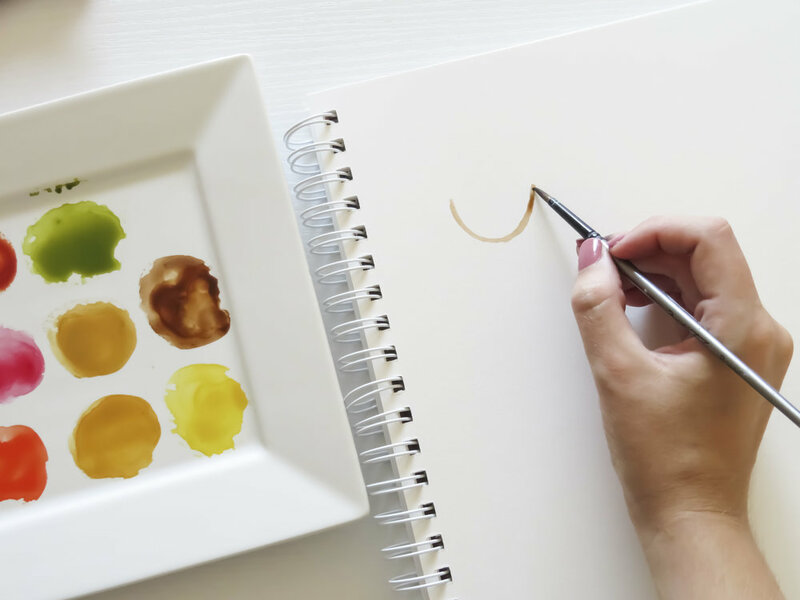 Begin with a golden or ochre color. The leaf base here is fairly simple, but it is curved. 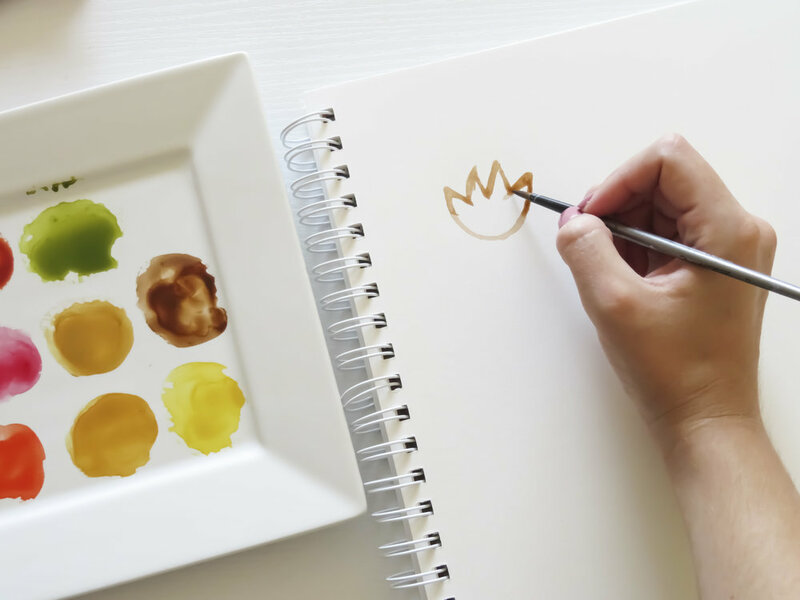 Draw the outline, then fill it in with the same color. 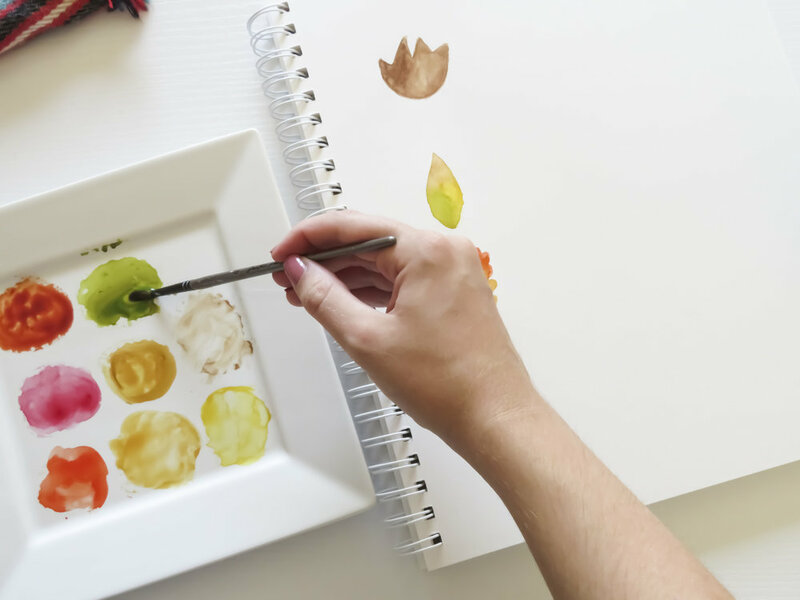 Next, grab some orange or red (whichever you have), and begin dotting the orange into the leaf base while it's still wet. The color will spread! Next, still using the orange, begin drawing the 'bumps' on the edge. Once you've completed that step, make sure the orange is nice and blended---no harsh lines here, people! Add more golden or ochre if need be. After that, dip into your green, and dot that into the leaf as well, adding bumps to the outside. 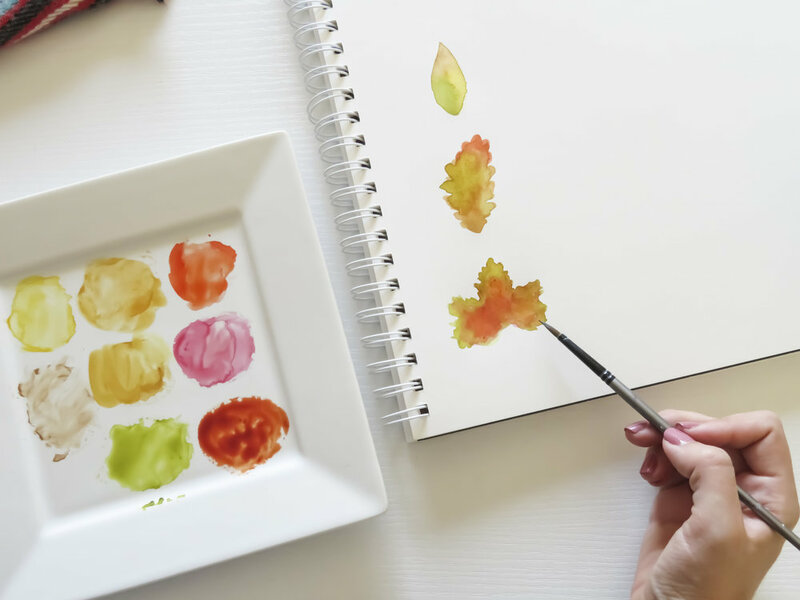 You can continue adding brown and yellow and green until your leaf resembles beautiful Autumn foliage, bumpy and textured all the way around! While that is drying, let's move to our final leaf, THEN we get to add accents and truly bring these leaves to life! This is my personal favorite leaf! Once again, it's a bit intricate, but nothing you can't handle. 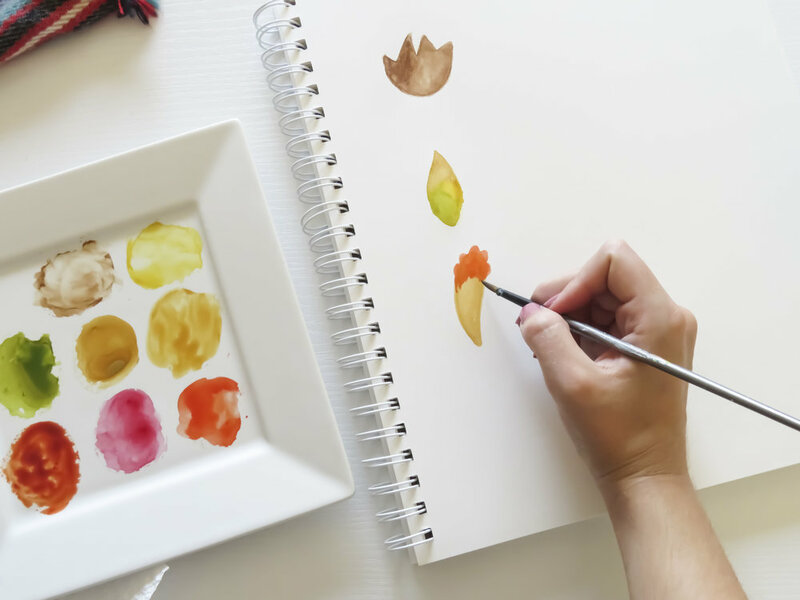 You're a leaf painting pro at this point! For this leaf, I'm starting with a red/pink base. 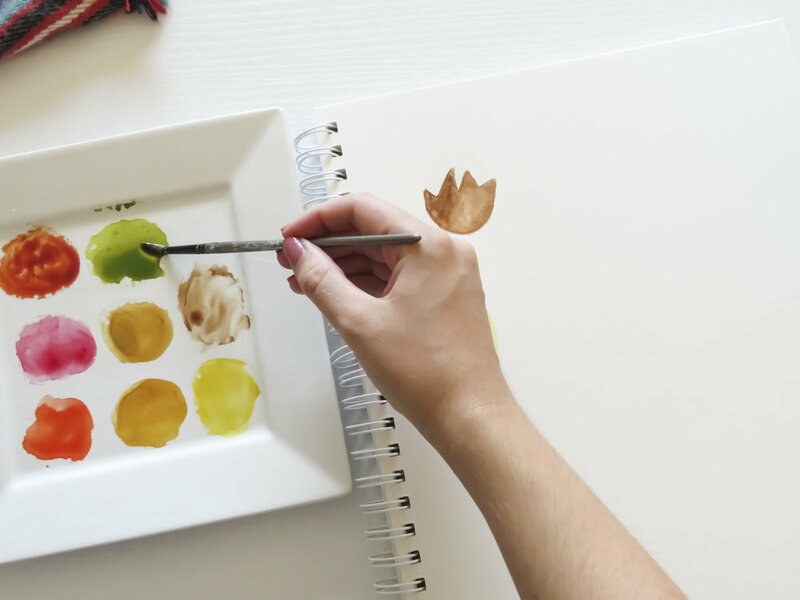 Begin by making a basic leaf shape, with those funky wings off to the side. 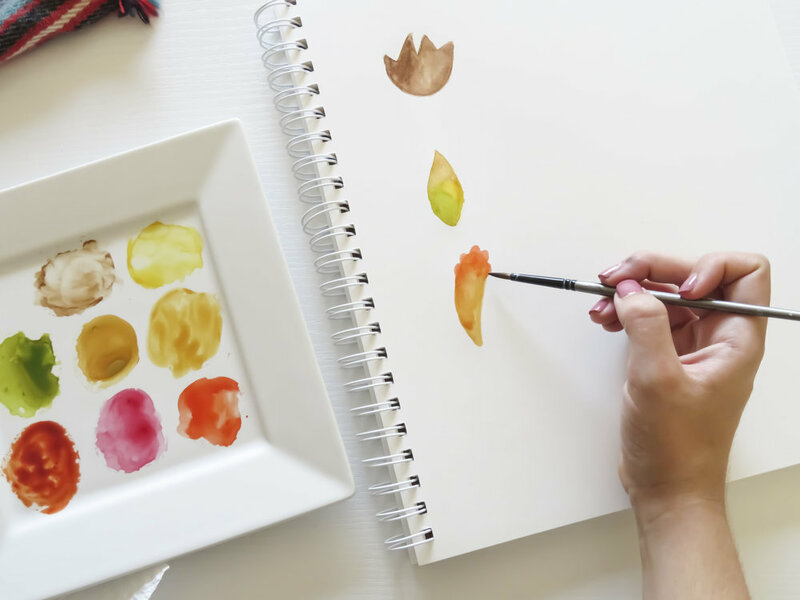 All three shapes should be overlapping, creating that familiar autumn leaf shape we all know and love! Fill in the shape with the red or pink color. 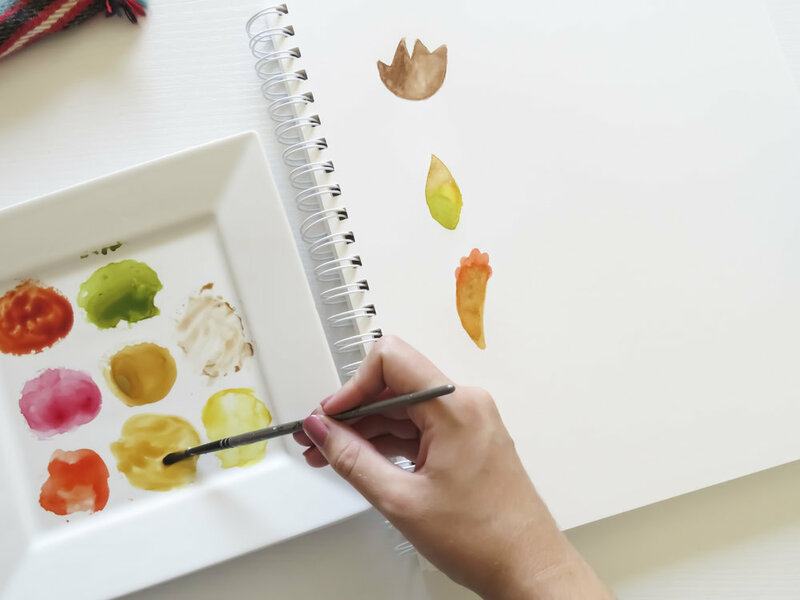 Next, grab some green and begin dotting it into the top and outside edges of each side of the leaf while the base is still wet. Add funky bumps and points to the outside (similar to the Beech leaf), feathering the color out to look really natural and organic. Here's a photo if you need a close, real-life look at the edges of the leaf. 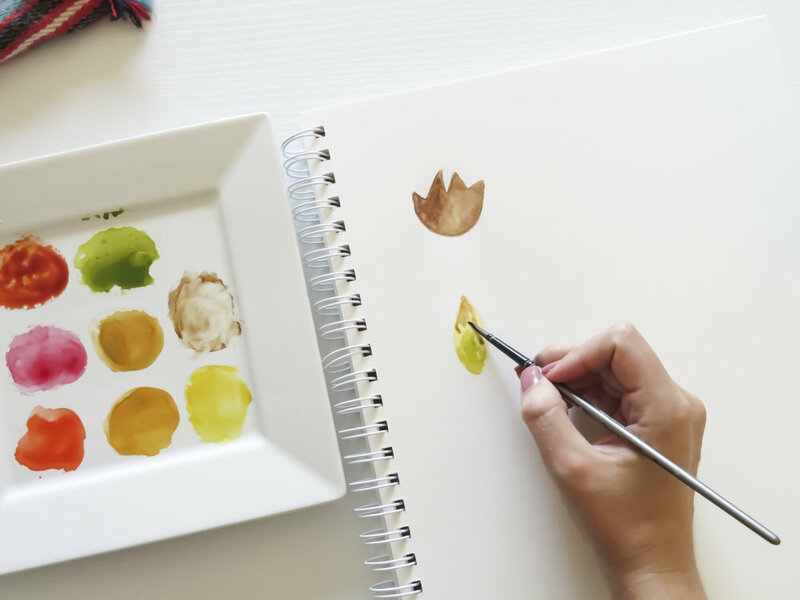 Next, dip into your orange and dot that color into the inside of the leaf, leaving a little space on the right hand side for some more ochre. 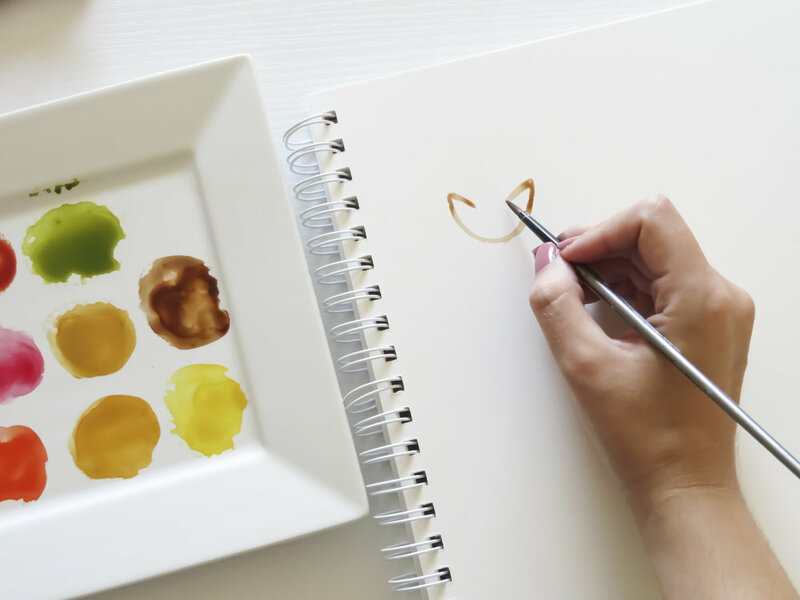 Make sure everything is blending together by adding a tiny bit of water to your brush and gently mushing everything around if need be. Finish by adding some gold/ochre to your leaf on the right hand side, and once again, make sure everything is blended! While that leaf is drying, let's move back to the top and finish off our leaves with accents! To add accents to each life, I'm using the bullet nib of my Tombow Dual Brush Pens. You can use black ink, acrylic paint, or really saturated watercolor. It's totally up to you, but this was easiest for me! I'm starting with brown to accent my Tulip Poplar. Begin with a thin line through the middle, bringing it downward and outside the shape, creating the stem. I made my stem a little thicker at the bottom to resemble a real leaf. Your lines don't have to be perfect! Imperfection makes them look much more real in my opinion. Finish by adding lines across the leaf, extending outward from the middle. Voila! You're done with this one. To finish the beech leaf, I'm using a tan color. 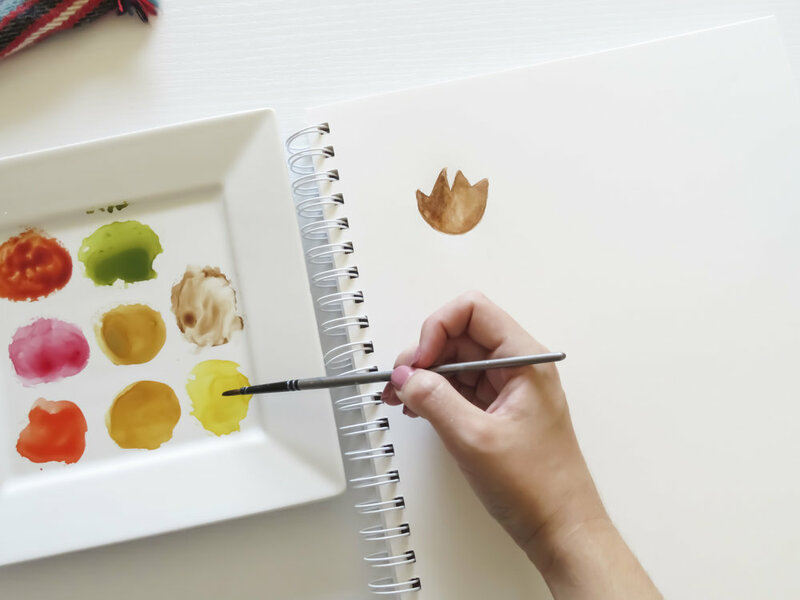 Begin the same way, drawing a line through the center, creating your stem, and then drawing the veins that extend outward from the middle. I kind of 'gently' let my lines get thinner and thinner until they disappeared. I like the effect this gave. I'm really pleased with how this one turned out! For the Cinnamon Oak, I'm combining my brown and tan for the veins of the leaf. I began with brown, creating the middle vein, stem, and some of the veins extending outward. Then, I used the tan color to extend the veins to the outside edges, and add more in the center. Finally, we're ready to complete our Sycamore leaf. I chose a red for this. I began with the stem, and then drew some lines extending outward, as seen above. And we're DONE!! AREN'T YOU SO PROUD? YOU'RE AN OFFICIAL LEAF PRO! Let me know if you're going to try this tutorial, and what you think of it when you do? Do you want to see more 'how to' posts like this? Whatever you're thinking or need to get off your chest---do it in the comments, y'all! Weekly e-mails are BACK! 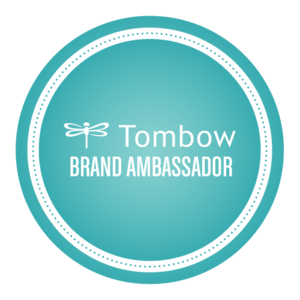 Sign up if you're feelin' fancy.